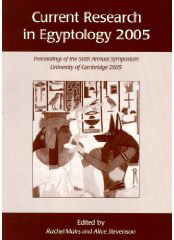 Description: The sixth annual Current Research in Egyptology symposium took place from 6th-8th January 2005 at the University of Cambridge. Although the topics covered by the papers were many and varied, if there is a general theme it would be that of exploring the borders and parameters of the discipline of Egyptology. Citation: Roxana Flammini, review of Rachel Mairs and Alice Stevenson, eds., Current Research in Egyptology 2005: Proceedings of the Sixth Annual Symposium, University of Cambridge 2005, Review of Biblical Literature [http://www.bookreviews.org] (2009).